An ingenuous character study, In Bruges follows two hit men as they hide out in the sleepy Belgian city awaiting their next orders. What follows is a delightfully unpredictable study of the human condition. Ray (Colin Farrell) and Ken (Brendan Gleeson) are two Irish hit men ordered to lay low in Bruges by their excitable foul-mouthed boss Harry (Ralph Fiennes). With the Christmas tourist season at its peak, the two are forced to share a room at a small hotel operated by the pregnant Marie (Thekla Reuten). Ray is young, restless, and tortured by a recent mission-gone-bad. Ken is older, wiser, calmer, and more experienced. Ray is immediately bored in Bruges, completely oblivious to the city's charming culture and sense of history. Ken is entranced, and keen to take in all that Bruges has to offer. Ray finds ways to get himself into trouble. He meets Chloë (Clémence Poésy), who may be a drug dealer pretending to be a film crew assistant. She may also be a specialist in seducing and mugging tourists, along with her skinhead ex-boyfriend Eirik (Jérémie Renier). Ray also meets Jimmy (Jordan Prentice), a drug-addicted, prostitute-chasing dwarf actor filming a surreal homage to Don't Look Now. When Harry finally makes contact with Ken to issue his next set of orders, a volatile situation ignites. 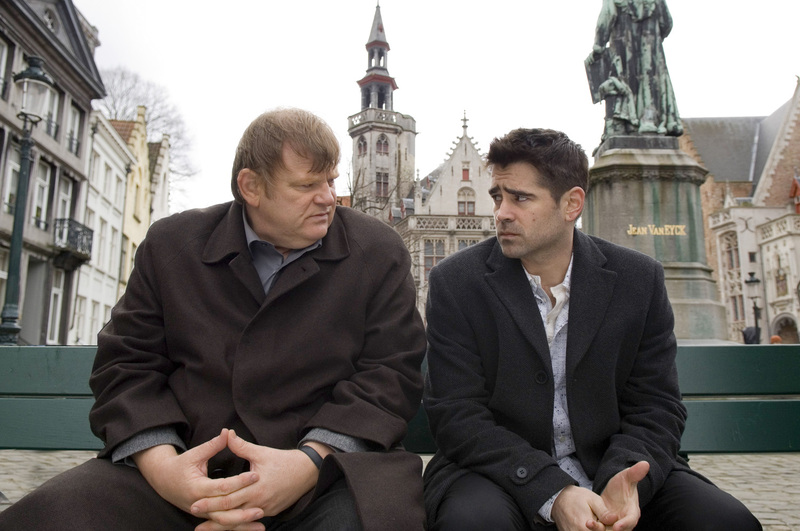 Written and directed by Martin McDonagh, In Bruges is a cerebral gem. Unfolding in layers to reveal secrets, agonies and deeply-respected codes of honour, the film marches to its own tune, taking every unexpected turn, avoiding the routine in favour of the quirky, and working its way to original territory where death is a punishment, an escape and a sacrifice. The film is a low-key exploration of two men at opposite ends of their careers, approaching the next chapter with a recent crisis in the rear view mirror and a lot worse to come. Ray and Ken are compelling enough, but McDonagh first adds the city of Bruges itself as a stellar co-star, and then Harry makes a personal appearance in the final third to pour fuel on an already simmering fire. Bruges is a captivating locale, and used as a device to underline the contrast between the two assassins. Ray is traumatized well beyond caring which city he is in, while Ken relishes the opportunity to take time off and immerse himself in the culture. The men continuously clash over their daily agenda, with a delicious irony to be revealed only when Harry's reasoning behind the choice of city is revealed. Colin Farrell has rarely been better. He presents Ray as a man undergoing a quiet catastrophe, looking for ways to distract himself that don't involve boring sight seeing. Brendan Gleeson is also at his best in one of his most prominent roles, Ken a quiet, loyal soldier who will always do what is necessary until confronted with a sublime situation where the act of killing simply can't win. The supporting characters further enrich the film. Hotel owner Marie, seductress Chloë, her violent boyfriend Eirik, the American dwarf actor Jimmy, plus illegal gun dealer Yuri (Eric Godon) all initially appear to be incidental to Ray and Ken's break from the job of killing. Once Harry wades into the sleepy city everyone who has come into contact with the hit men will have a role to play in defining their future. The life of assassins is not for the faint of heart or the error prone, but that does not mean it can't be frequently funny. The laughs are sharp, the set-pieces often hilarious, and on many occasions quite politically incorrect. In Bruges, death holds hands with dark humour and together they saunter down alleyways steeped in history, filled with echoes of plans gone horribly wrong.